This was a remarkable experience going to Morryde for their in shop service and installation of my new IS System on my 38RL! Pictures attached show the RV, partial and full installation of the IS system on my unit. The latter pictures are of all the junk they removed from under the RV. I mean close inspection of these parts revealed allot of wear and tear and potential failure. The pictures included show the install, without the Brake Lines installed yet! After leaving Morryde and heading home, I definitely gave the IS system and incredible workout. Down thru Indianapolis and down I70 was enough to jar your teeth loose. Trailer road fine and the IS did its job! So, I gotta ask but before I do, please understand that this is the only fifth wheel I’ve ever towed. In fact I’ve never even been in a vehicle that was towing a fifth wheel before. Prior to the RW, my total experience with towing a 5er was seeing others being towed down the highway. With that being said, how do you tell the difference that the IS makes? General handling of the coach and the whole rig, if you add disk brakes you'll live them too. Hardly ever have anything move around inside, and oh yeah. NEVER HAVE TO BE CONCERNED WITH SPRINGS, EQUALIZES, BUSHINGS ETC. AGAIN. Have had it on ours over five years and more than 40k miles so far with no issues. Will never have another fifth wheel without IS and disc brakes. After having the IS system installed, I was required to take the RV for a test drive around the block (actually 2 blocks). I had a Metal Drink Cup sitting on the kitchen counter. When I returned to Morryde and looked inside, the Cup was still standing on the counter. And the 2 block trip wasn't on new paved roads either, but rough city streets and across 2 railroad tracks. Had I did the same test drive with my old axles and shocks, that cup would have fallen. THE IS system with Disc Brakes are worth every penny! We now leave the coffee pot on the counter, along with the glass salt and pepper shakers... I leave water in the dogs bowl at times ( by mistake ) and there are NO drops on the surrounding floor. As far as the ride, OR SHOULD I SAY GLIDE.... it really feels like it is gliding behind you... no more holding on at bridge approaches. This is the second fiver with the IS, and DW has already stated that if and when we get another, it will have the IS on it BEFORE we pick it up... And that is coming from someone who DOES NOT usually understand the quality of stuff like that. Just to expand on Ford Truck Guy: The IS system is designed to help with the rough roads we all have traveled on in this country. There will be times while driving on rough roads that you will feel every bump. I have a Trailer Saver Air Ride Hitch and Morryde Pinbox. And even Overload springs on my BIG Dodge 3500, I still feel some bumps and sometimes bumps that will knock your teeth out. But, the RV is riding smooth and that is what the IS is truly designed for. I looked at the Shackles on my old Axles and Springs. The Shackles were in very bad shape, after only 18000 miles on the road. Replaced the 7K axles with 8K IS and Disc Brakes. Again, Money well spent. And Morryde stands behind their work and product. I want to thank you for taking the time to post pictures and your opinion...…. HOW EVER I WILL BE IN TROUBLE WITH MY WIFE>>>> I now know there is $6900 bill in my near future. We have a 38RL also and I have been saying to my wife that disk brakes and better ride for the coach is a must. I have spent to much time putting screws in that pull out and putting things back in the way they should have been instead of looking like a shake and bake zip lock in every cabinet. FYI your old drum brake where getting to much lube. put 2 or three pumps in every 3000 ~5000 mile or once yearly. 20-30 years ago we never lubed the front rotors on your 1980 cars . every time it went in for a front brake job they work clean inspect and repack wheel bearing. true the load your camper bearing carry is higher but same grease. If you don't mind me asking what axel did you have them install 7000 or 8000? I am thinking about 8K IS. Last time I was on the scale last fall I had almost 13000lbs on the tires of the coach. I know the 7k would be enough but you do get a larger outer bearing with the 8K axle. they may need to down grade the rubber spring to 7000 or slightly more with the 8K ???? I know about the grease, I had blown a seal on the one Hub. Fortunately, the IS axles won't need much maintenance for 12 to 15 thousand miles, according to Morryde. Also, concerning the 7 or 8K axles, will not give you more carrying capacity if you go with the 8K. You cannot exceed the original GVWR that was set at the factory, when the unit was built. My GVWR is 16500 and I have a 38RL like you. Morryde NO Longer weighs the Axles anymore, so I suspect they use one type of Rubber Spring. They will measure and level the RV both before and after installation. In my case the RV was Riding about 1.5 inches high in the back. They installed the IS and the RV is now level front to back. When I say level front to back, that is with the RV hooked up to the Tow Vehicle. 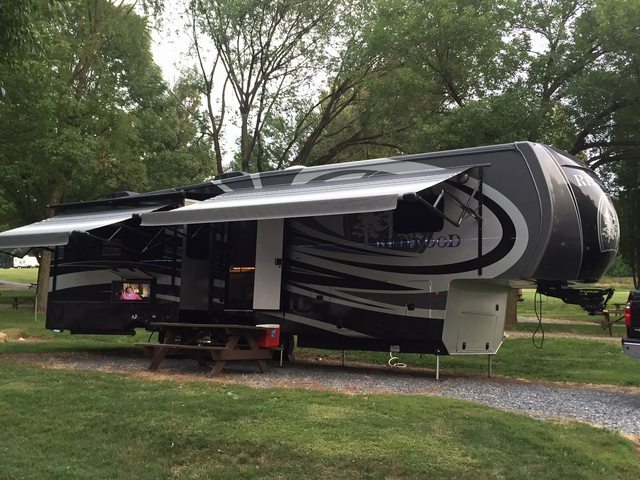 You won't regret putting the IS on your RV. My previous trailer had the 7K IS installed during delivery. 2 years later we were at MOR/ryde putting 8K in, which is what I wanted in the first place, but let the shop manager talk me out of. The amount of steel difference is substantial going from 7K to 8K. The springs are the same except for capacity between the different axle sizes. They are rated by 'durometer' and you can put 7K rated springs on an 8K axle. I was at MOR/ryde in March and got to see all of their axles at one time. To get bigger bearings you need to step up to to the 9K IS. The outer wheel bearing on the 9K is the same as the inner wheel bearing on the 8K axle, it is huge. Those bigger bearing are installed in larger rotors and 10K rated disc brakes. MOR/ryde calls them 9K disc brakes but Kodiak says they don't make 9k, 8K then 10K is the next step.